Oasis Academy Parkwood needed some inspiration for their playground to further engage their Early Years, Key Stage 1 and Key Stage 2 children. For all levels of learning, the playground environment was no longer challenging and the school playground equipment was beginning to look old and out-dated. 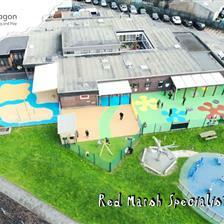 The school needed a revamp to encourage imaginative play, creative thinking, problem solving, safe risk taking and physical development. Our Outdoor Learning Consultant and Director, Paul Bayliss, worked closely with the school to ensure their playground transformed into an inspiring hub for learning through play. The early years playground was lacking exciting resources for imaginative play and the free flow access from indoors, needed improving to ensure the outdoors became a continuous extension to learning within the classroom. To do this and improve free flow play, we fixed an excellent Timber Canopy to the school building. The children will now treat the inside and the outside as one giant classroom and be further encouraged to explore their new environment. The Canopy is watertight and includes cladding and glazing to protect children from rain and wind during play. One part of the playground was getting badly affected by the English weather, making it unusable for large parts of the year. We used our natural looking artificial grass to transform the area and ensure play and learning continues to take place in all weathers. On the lovely green artificial grass, we installed a huge whiteboard and blackboard to give the children opportunities for outdoor mark-making. To encourage investigative learning and problem solving, we installed our wonderful Water Wall – the ideal resource for children to grasp science-based theories and understand topics such as the water cycle, flow and gravity. For further role play encouragement, we installed our ‘mud-tastic’ Mud Kitchen. Children will love creating mud recipes together and the feel of mud itself, can have a wonderfully calming effect on many children who find it hard to concentrate. We designed and installed a magnificent bespoke Adventure Play Ship with bright blue Wetpour surfacing underneath. 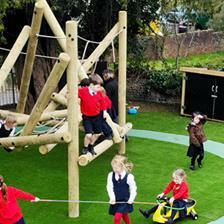 The Ship design includes climbing challenges, a slide and spaces underneath for den-making. This is an excellent playground resource for imaginative play and a platform for fun role play activities. For instance, children might play pretend as pirates and sail across the seven seas… who will be walking the plank today? We then created a zone for literacy, language and communication with an excellent story telling area. The area was made more inspiring with the additions of our Mushroom Seats and beige Playbond surfacing. For role play and den-making, we installed a large Wig Wam which will become a fun place for children to play and create imaginative games together. The teachers wanted to take lessons outside, and to ensure this was possible, we installed a watertight, outdoor Gazebo. The perfect place for outdoor learning. To inspire active play and physical development, we gave the children one of our challenging Junior Trim Trails. This particular trail has 11 challenges, aimed at improving children’s balance, strength and gross motor skill development. This was a fantastic playground development covering the 7 areas of learning and continual development through to key Stage 2. 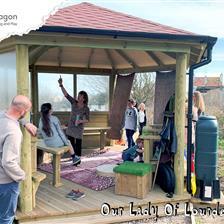 Are you looking to improve your outdoor learning environment? Feel free to fill out our Contact Form and we will be in touch to arrange a free consultation.